THIS IS A COLORFUL FEED SACK – RED, PINK, AND WHITE WITH BLUE FRUIT – AND IS FROM THE SAME ESTATE SALE AS THE OTHER FEED SACKS WE’VE LISTED! THIS ONE WAS NOT PROPERLY OPENED – IT APPEARS AS THOUGH THE THREAD WAS CUT OR TORN INSTEAD OF BEING PULLED/UNRAVELED CAUSING THE MATERIAL TO HAVE A SOMEWHAT JAGGED TOP EDGE. BECAUSE OF THIS, THE SACK MEASURES 33” IN LENGTH. SIDE AND BOTTOM SEAM HAVE NOT BEEN REMOVED/OPENED. FEED SACK HAS BEEN LAUNDERED AND PRESSED. VERY PRETTY! WE HAVE LISTED MANY LOVELY AND UNUSUAL FEED SACKS (AND HAVE MANY MORE TO LIST) BUT THIS ONE IS BY FAR THE MOST UNUSUAL! 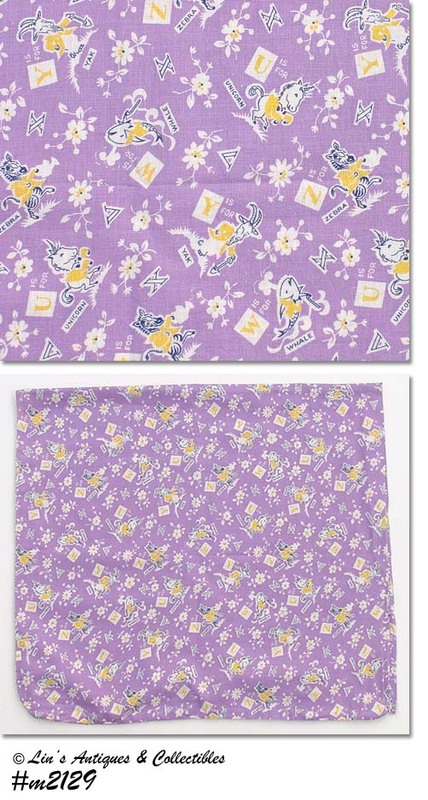 IT HAS A PURPLE/LILAC COLOR BACKGROUND AND THE DESIGN IS ALPHABET LETTERS U, V, W, X, Y, AND Z!! INTERSPERSED THROUGHOUT THE FEED SACK ARE THE LETTERS V AND X – THEY ARE WHITE LETTERS OUTLINED IN BLACK AND ARE INTERSPERSED WITH PRETTY WHITE FLOWERS WITH YELLOW CENTERS. THE LETTERS U, W, Y, AND Z ARE YELLOW INSIDE WHITE SQUARES AND SHOW AN ANIMAL FOR THOSE LETTERS – “U IS FOR UNICORN”, “W IS FOR WHALE”, “Y IS FOR YAK”, AND “Z IS FOR ZEBRA”. PLEASE SEE THE CLOSE-UP PHOTO OF THIS FEED SACK. 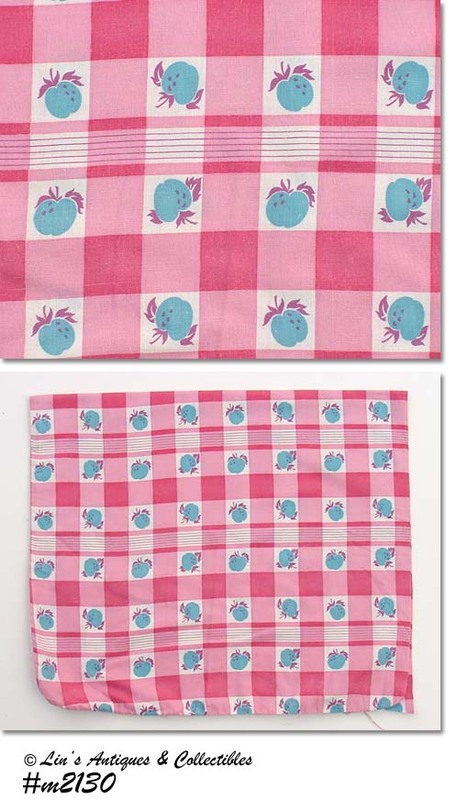 FEED SACK MEASURES 36” LONG, 20” WIDE (APPROXIMATELY 40” WHEN SEAM STITCHING IS REMOVED). IT HAS BEEN LAUNDERED AND PRESSED. LOVELY COLORS AND AN UNUSUAL PATTERN ON THIS FEED SACK! THE BACKGROUND COLOR IS GRAY, THE DESIGN IS OF WHITE FANS OUTLINED IN ORANGE/RUST COLOR AND HAS ORANGE/RUST COLOR FLOWERS INTERSPERSED WITH YELLOW FLOWERS AND GREEN LEAVES. FEED SACK MEASURES 36” LONG, 20” WIDE (APPROXIMATELY 40” WHEN SEAM STITCHING IS REMOVED). IT HAS BEEN LAUNDERED, PRESSED, AND IS IN WONDERFUL CONDITION. VERY PRETTY! 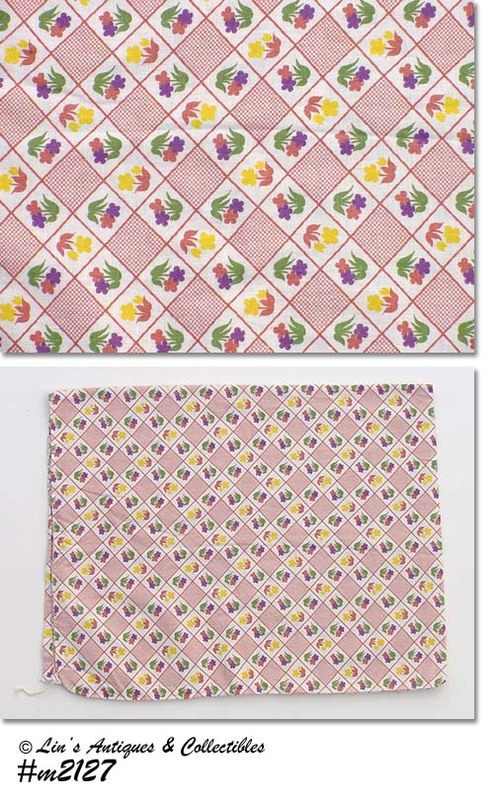 LOVELY PATTERN ON THIS FEED SACK – IT’S A WHITE BACKGROUND WITH LITTLE SQUARES OF PRETTY BROWN/TAN CHECKS THAT ALTERNATE WITH COLORFUL FLOWERS OF YELLOW WITH BROWN LEAVES AND PURPLE AND TAN FLOWERS WITH GREEN LEAVES. UNUSUAL! THIS SACK IS A LITTLE SMALLER THAN OTHERS WE HAVE LISTED. IT MEASURES 33” LONG, 20” WIDE (APPROXIMATELY 40” WHEN SEAM STITCHING IS REMOVED). IT HAS NOT BEEN CUT OR ALTERED IN ANY WAY, IT’S JUST NOT AS LONG AS THE OTHER FEED SACKS. LAUNDERED, PRESSED, AND IN EXCELLENT CONDITION. THIS FEED SACK HAS AN UNUSUAL PATTERN WITH VERY PRETTY COLORS! IT HAS A WHITE BACKGROUND WITH BEAUTIFULLY DETAILED FLOWERS AND LEAVES THAT ARE IN TWO SHADES OF PURPLE. THE FLOWERS COULD BE MORNING GLORIES OR CORNFLOWERS AND THEY ARE LIGHT AND DARK PURPLE COLOR. FEED SACK HAS BEEN OPENED AND MEASURES 36” X 42”. I HAVE LAUNDERED AND IRONED IT AND FOUND IT TO BE IN WONDERFUL CONDITION. THERE IS A 1/8” X 1/8” THREAD SEPARATION/SNAG IN ONE FLOWER.